This September Forum focussed on carbon neutral business strategies. In her keynote address, Cllr Xanthea Limberg, the City’s Mayoral Committee Member for Informal Settlements, Water and Waste Services; and Energy challenged businesses to ‘future-proof’ their enterprises by implementing resource efficiency. She argued that ‘efforts to enhance Cape Town’s resilience as a whole are key to facilitating future investment and protecting existing enterprise. Implementing changes to the way things have historically been done can be challenging and uncomfortable, but there is a need to reform these systems in the interests of long-term rewards and resilience. The City provided a drought update and presentations on the amended water bylaw and the Water Star Rating certification for water management. The Amended water bylaw was released in May 2018 and encourages water-saving, regulates water use, plumbing installations and allows for water restrictions when necessary. The Water Star Rating certification recognises integrated water management and aims to promote best practice in water management, water savings and pollution control in various sectors including the business sector, government departments, education and health institutions and residential estates. An innovative case study on water management and various support resources for best practice water management were presented, and these can be found here. Sarah Ward, Head of Energy and Climate Change in the Sustainable Energy Markets Department, highlighted that electricity consumption across the city stands at 37.1% below the projected business-as-usual and at least 11.6% less than the 2007 consumption levels. 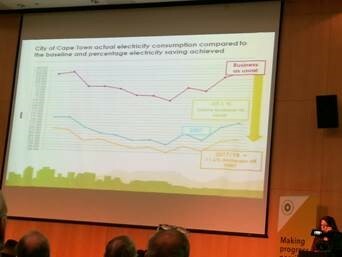 This demonstrates that Cape Town remains energy efficient and demonstrates clear evidence of decoupling of economic growth from electricity consumption. Ms Ward introduced the ambitious commitments that the City of Cape Town has made towards transformative climate action. These commitments form part of the C40 South Africa Buildings Programme and the C40 Climate Action Planning in Africa Programme, which are working towards carbon neutrality for all new buildings by 2030 and city-wide carbon neutrality by 2050 respectively. These commitments are closely aligned with the City’s Climate Change Policy and Energy2040 carbon targets. Megan Euston-Brown from Sustainable Energy African (SEA) went on to detail the South Africa New Buildings Programme of the C40 global network of cities (with SEA as local implementing agent). Four SA cities - City of Cape Town together with City of Johannesburg, City of Tshwane and eThekwini Municipality – have committed to ensuring that all new buildings are carbon neutral by 2030. Policy pathways to achieve this include the development of a building bylaw that is more stringent than national regulations, transition to cleaner energy, incentive packages to promote net zero carbon buildings and precincts and capacity building. Stakeholders will be engaged by cities as they develop this work. Megan emphasised that the business-as-usual approach to urban development is no longer feasible and there is a need to tackle urban form and resource efficiency more broadly. Manfred Braune, an Executive Director at the Green Building Council of South Africa (GBCSA), highlighted the benefits and impacts of green buildings, making reference to the MCSI IPD South Africa Annual Green Property Index. Manfred provided an overview of the Net Zero/Net Positive certification for carbon, water, waste and ecology. The certification leverages off existing GBCSA standards and is applicable to new buildings, major refurbishments, existing buildings in operation, tenants and precincts. The heart of the forum comprised of presentations and a panel discussion where representatives from Virgin Active, Woolworths and Growthpoint shared their business strategies on transitioning towards carbon neutral operations and 100% renewable energy solutions. Wesley Noble who is Head of Changing Business for Good at Virgin Active detailed their plans to become a restorative enterprise and outlined their net zero pathways for carbon, water and waste. The pathway focuses on reducing water consumption, switching to renewable energy where possible and eliminating solid waste through recycling. Feroz Koor, Group Head of Sustainability at Woolworths articulated Woolworth’s vision is to be one of the world’s most responsible retailers and emphasized their commitment to halve their energy impact by 2020 and source all renewable energy by 2030. Nardo Snyman from Growthpoint stated their commitment to fighting climate change and decreasing their carbon footprint across the portfolio. Some of this includes increasing their buildings’ resource efficiency in terms of energy, water and waste; introducing smart technologies into buildings for more effective energy and water efficiency and finding renewable or sustainable forms of energy and water production to decrease dependence on the current carbon intensive supplies from municipalities. The business strategies illustrated the enormous opportunity presented by partnerships with the private sector if the City is to achieve its ambitious goals. The innovation and leadership of the businesses was inspiring.